The general belief or myth is that is costs more to use a travel agent when booking your vacation. That is simply not true. Actually, the opposite can be true after you see what kind of special deals an agent has access to and the savings you will incur thanks to their expertise. I was a travel agent for many years and still get requests for assistance with vacations from my readers and past clients. I can offer advice but I no longer have any affiliation that allows me to book trips, so I ask anyone out there that is interested in planning a vacation, please call Carolyn, a.k.a. Blondie, at Why Not Travel. You will be in good hands. One of my absolute favorite vacations is when we take the time to drive up the coast of California. As most of my savvy readers already know, I live in the SoCal region (Southern California for all you folks not from around these parts). So, our journey really begins when we reach Ventura. The first couple hours from our home in the Inland Valley to the coast is more of an adventure as we make our way through and around Los Angeles and it's neighboring overpopulated cities. When you break through and reach Ventura, you start to smell the salty sea and life takes on a more casual existence. (It is also a great place to stop and pee). Ventura is nicknamed "the city of good fortune" and is known for it's scenic coastline and it's historic Downtown district. When we drive along the coast we try not to make any one place our destination. We like for the whole drive to be the destination. We stop frequently for those Kodak moments as it seems that every turn we take is another breathtaking scene that we feel we have to capture. Personally I never mind getting caught behind a huge RV struggling around the turns and up the mountain because it forces us to take our time and see even more things. Our next favorite place along the way is Santa Barbara. We don't usually stop here as a family but we have been known to do a romantic getaway on occasion. We love to walk on the beach and take pictures of the seagulls and all their feathered friends. Then, we stroll along Stearn's Wharf and check out all the cute little local shops before choosing a restaurant. Last time we were there we ate at Longboard's Beach Bar and Grill. It is billed as casual dining for locals and visitors alike. The food was good, but I defintely think it is the local's place to be as it was sure crowded and noisy and it appeared everyone knew everyone else. We did see Dennis Miller there, but chose not to be crazed fans and left him to eat his dinner in peace. 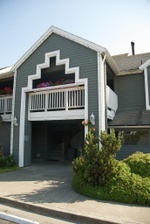 We like to stay at The Hotel Oceana, located directly across from the wharf area. The rooms are delightful and affordable, and the customer service is superb. The best time to visit Santa Barbara is when they are having an event such as the Big Dogs Canine Festival, local artists exhibits, or celebrating a holiday such as Cinco de Mayo. It is a very outdoor and casual city. A few miles north you will have a choice to either continue on Highway 1 or to turn inland a bit on Highway 101. If you do not have a specific destination on Highway 1, I recommend you head inland. This will take you to the sleepy little town of Buellton. The name of the town does not usually stand out in anyone's mind, but many people have heard of Anderson's Split Pea Soup. This is what puts Buellton on the map. Just a few more miles off the beaten path is Solvang. This little town takes you back in time to a small Danish village where food,wine and baked goods are the main attraction. You can take a tour of the wineries, ride bicycles, or shop in the shops where you will encounter folks dressed in authentic Danish costumes. Whatever you do, don't leave without a bucket of famous Danish shortbread cookies. The drive through the countryside on Highway 101 will certainly make you feel relaxed and possibly thinking of where you would like to retire. At least that is what it does for me. The rolling hills are dotted with those healthy free range California cows that you see on all the TV ads for milk and cheese. There are some roadside tasting rooms for some of the hidden local wineries along the way, as well as an occassional produce stand or antique store. We usually head up to San Luis Obispo before getting back on Highway 1, where our next favorite destination happens to be Morro Bay. Morro Bay is marked on the map by it's own natural wonder, Morro Bay Rock. Back in the day, Morro Bay was a busy little port used to import dry goods for farmers and export their dairy, meat and produce. It later became a fishing port, developing a huge abalone fishing industry. Today, Morro Bay is governed mostly by the tourism industry, but is still used as a fishing port. If you are in the market for a fresh seafood meal, this is the place. There are several great restaurants along the Embarcadero where you can count on the "Catch of the Day" being prepared just the way you like it. We chose the Harbor Hut, where we discovered the best clam chowder we had ever eaten. Little did we know at the time, they are famous for it. There is a great view of the harbor and "the rock" while dining in a warm, inviting atmosphere with great service. I could sit there all day with a nice bottle of...well, just about anything! Morro Bay is also host to many special events so check the calendar before planning your vacation. You might be able to see a kite show, a car show, or participate in an oyster festival. After leaving Morro Bay, the drive is all coastal. The scenery is breathtaking and there are so many places I want to stop for pictures that sometimes it feels like we aren't making very much progress. There is a very popular tourist attraction along this drive, right near the area of San Simeon. Hearst Castle is rich in history and art and ambiance, along with architecture and beauty. There are daily tours available so you can experience the castle in all it's glory. For more information on the tours and the history behind Hearst Castle please visit their website. Allow a lot of time for this stop. There are several tours and there is a lot to see including the museum and the gift shop. Every time we make this trip we stop by and see our friends, the Elephant Seals. They are located at Piedras Blancas just a few miles past Hearst Castle. There are literally hundreds and hundreds of Elephant Seals just sunbathing on the beach. There are so many that sometimes you look right at them and don't realize right away that is what you are looking at. It looks more like a rocky beach. To learn more about the Elephant Seals and the folks who work hard to protect them, please visit Friends of the Elephant Seal. For a very special treat, please click on the Elephant Seal Live Web Cam. This will give you a chance to view the seals without getting wind blown, which is usually the case in this area. Our most recent trip up the coast took us to a new place, The Ragged Point Inn. It was accidental that we ended up there since my original search for lodging was supposed to be for the Big Sur area. Ragged Point appeared in the search results so I assumed it was close to where I thought I wanted to be. I fell in love with the description of the tranquility and the nature and the ocean view from the cliffs where this quaint little place sits, so I booked it immediately. The price was right and it sounded just like what I needed. It was a few days later that one of the family members pointed out that it was about 50 miles south of Big Sur. This could have posed quite a dilemna but instead of changing our location to accomodate our schedule, I changed our schedule to accomodate our location. I am certainly glad that is what I did because as it turns out, we couldn't have been happier with our experience at The Ragged Point Inn. Our room was about 20 feet from the edge of the cliff with amazing views whether sunrise or sunset. The grounds had nature trails and gorgeous flowers, along with butterflies and ground squirrels and wild bunnies. There is a restaurant on site that prepares amazing food and offers some of the best local wines. You can dine indoors or out, and the service can't be beat. They also have a gas station with a little mini market, a coffee bar, and a gift shop. The Ragged Point Inn has been family owned since the late 1950's and you can surely tell because they make you feel right at home while you're there. I can't wait to go back. I hope to make this a yearly getaway. Our final destination on this trip was about an hour north to an enchanted little place called Nepenthe. This has been a family favorite visiting site for generations so naturally we stop by whenever we are in the area. Nepenthe has always been known as an artist's retreat. It was a place where people went to get away from the hustle and bustle and lock into their creative minds. The first famous owners of what used to be a small cabin overlooking the cliffs was Rita Hayworth and Orson Welles. They purchased it as their love retreat, only to never spend a night in it. They sold it in 1947 to the Bill and Lolly Fassett family, who's grandchildren and great-grandchildren operate it today as a restaurant for all travelers and locals alike. The Nepenthe Restaurant serves food that has been created over the years from family tradition. The property now boasts, in addition to the restaurant, The Phoenix Gift Shoppe, and the Cafe Kevah. The wonderment that surrounds this place can only be experienced in person for the true effect, so I strongly suggest you put this on your list of family favorites when you are driving Highway 1 along the coast of California. Forget the Chocolate Bunny, Give Me the Chocolate Wine! I was recently invited to attend a very special wine tasting event at Thornton Winery, located in the breathtaking Temecula Valley Wine Country. The warm and welcoming Thornton family had a new series of wines that they were unveiling and some of us lucky press writers were included in the fun. I say "fun" because what else could you possibly have when combining chocolate with wine? I am sure the picture you have is of all of us lazy travel writers sitting around sipping wine and getting plump on chocolate. That is not what happened at all. First of all, you must understand that the chocolate is actually in the wine, not necessarily paired with it. As a matter of fact you would be amazed at what you can pair with chocolate wine. It is not just for dessert. Our first tasting was Creme De Cocoa, the NEW Chocolate Lover's Wine. This wine is smooth and creamy and can be served chilled, on the rocks, or traditionally, right out of the bottle. This wine was hands down my favorite and the one I hope to see in my Easter basket instead of the chocolate bunny. I was very surprised when Thornton Winery's very own Chef Steve Pickell paired this yummy wine with a Moroccan tomato jam and a very dry, aged Jack cheese. I was even more surprised at how much I liked it together. This was a perfect example of why we must keep an open mind and leave some things to the experts. Our next taste was of The Chocolate Lover's Wine. This is a deep red wine with hints of black cherry and dark chocolate. As you swirl the wine around in the glass, you can smell the sweet aroma of chocolate as though you were in a bakery. This is a more traditional style of wine, not at all creamy like the first one we tasted, but still very appetizing if you enjoy the sweeter wines. Chef Pickell paired this wine with a small tasting of smoked duck breast in his very own flavorful style. Again, I was totally amazed at how well these flavors all came together perfectly. Our third taste was called Dark Chocolate or "Coco Rosso". I feel this wine is for a more dinstinguished palatte than mine. It is very close to a tradtional deep red wine with a hint of dark chocolate. Neither of which are my favorites, but I did notice many of my fellow tasters were quite impressed. Along with this dark chocolate wine, Chef Pickell served an Oaxacan braised short rib that literally melted in your mouth. Here is when I really appreciated his talent for pairing because the full flavors of the short rib really smoothed out the sharpness I found in the wine. Together they are quite the pair! Our last but certainly not least wine of the day was the Chocolate Strawberry. This is a bright, refreshing wine, much lighter than the others. While still tasting the cocoa, you also experience the freshness of strawberries. I believe this will make a perfect summer dessert wine for even the most finicky of wine snobs. I must not be too far off with my opinion because our chef paired this wine with a coconut almond torte drizzled with white chocolate and raspberry cream. It really was a great ending to a great tasting. For those of you that are feeling some pangs of thirst for chocolate wine and maybe some of the decadent food they were paired with, you can visit Thornton Winery and have a similar experience in their Champagne Lounge. They encourage a full tasting experience by offering specially paired food with their wine flights. John Thornton, owner of Thornton Winery, when asked which foods paired best with these wines, answered "All of them". John Thornton, along with Chef Steve Pickell, and Steve Thornton, President of Thornton Winery were our three gracious hosts for our day of chocolate wine tastings. I have to say that as upscale and "old world" as Thornton Winery appears, they are just as down to earth and warm and welcoming as family. So, I highly recommend to all my savvy readers to drop by and meet the Thornton family and taste their fine selections of wines. Don't forget to pick up some Creme De Cocoa for the Easter basket. While out shopping one day, hubby and I decided we wanted to take a break and get some lunch. Of course this is always hubby's evil plan. If we are going out to shop, then we are going out to eat. We were shopping at The Menifee Marketplace in Menifee, CA. when we saw that a new BBQ restaurant was open. Well, I think everyone is always on the lookout for the next best BBQ, even the folks on the Food Network. The BBQ Trio is located at the far northwest corner of the shopping center over by Starbucks. We walked in and the place was packed. Always a good sign, right? I never know what I want when it comes to bbq food, but this time it didn't matter. They offer a Slider Sampler where you get one each of pulled pork, beef brisket and bbq chicken, along with a side dish. I chose the red potato salad. I am a very picky potato salad eater but I really loved theirs. It is fresh and has a hint of dill in it. The only complaint my hubby had was that he needed more bbq sauce on his meal so they gladly gave him a side cup with more sauce. He chose the same sampler entree but instead he chose the baked beans. I am not a big bean eater, but he said they were very good. After having such an enjoyable experience we tried again for carry out one night. I phoned the order in ahead of time. They asked what time I wanted it ready by and were happy to accommodate. When I arrived I was greeted by name and my order was ready to go. The folks at BBQ Trio are always very friendly and helpful. The only problem I see in the future is the size of their eating area. They may have to think about expanding soon. So, if you are looking for some good bbq, look no further. BBQ Trio is a real treat. Remember if you get it to go, ask for some extra sauce. I wonder if I can get the recipe from them cause it sure is good! I am the only travel agent in the world that has been aboard a train and never left the station, and roamed the decks of a huge cruise ship but never left port. Until now that is. I decided on a spur of the moment trip to Santa Barbara with hubby for his birthday, but did not relish the drive through city traffic. Instead I wanted our mini vacation to start as soon as we left the house. So, we opted for the train up the coast. Since this was my first adventure by train I was like a kid in a candy store. We traveled in the middle of the week so the train was practically empty and very quiet. We sat on the top deck so we could see everything there was to see. We departed from the Oceanside, CA terminal and therefore began our journey with the ocean at our window. We zoomed up the coast speeding past all the cars on the road and watching the surfers ride the waves. I figured we would be there in no time flat at the rate we were traveling. Well that fun lasted approximately 20 minutes. We slowed down to a crawl upon arriving at the first stop along our route which was San Clemente. We were only there long enough to hurry people on and off which only took a few minutes. At this point I was still pretty excited because I had never visited the San Clemente train station before and it was very old and quaint with lots of flowers. It was a nice first stop. Unfortunately, the next stop was San Juan Capistrano which you could hit with a stone from San Clemente so needless to say we barely got above a crawl for the next 5 minutes. After that we stopped in Irvine, which was about 13 minutes away, Santa Ana, about 10 more minutes up the track and then Anaheim. This little stretch of travel took almost an hour. I am not sure how, except that we travel very slowly in this area since it is so congested and residential. At one point I thought if I got out and pushed (or at least walked) we might get there sooner. After Anaheim came Fullerton and then the longest stretch thus far...to Los Angeles Union Station. Let me tell you a little bit about what lives near the tracks between these 3 destinations. This is where many commercial storage yards are located including where old school buses and porta-potties go to die. There are junk yards and scrap yards and lumber yards and storage facilities that appear to be lived in. Let me just say this was not in any way a glamorous journey through the city. I am glad we didn't actually stop at any of these places, but I would have been happier if we had been going faster. I was so excited about arriving into Union Station that I insisted on getting out to take pictures. I expected to see some really cool architecture and things like you only see in the movies. I had exactly 13 minutes I believe the conductor said. So, I ran off the train and down the corridor into the station with my camera. I didn't really know where I was going, I was just part of the herd. Well, when the herd arrived at an intersection they all split up and went their separate ways, leaving me to wonder which yellow brick road I should take. I couldn't see anything relevant except endless pathways to somewhere and I didn't know how long it would take me to get to where I could take some cool pictures so I just kind of froze and took in the scenery. Everyone seemed to know where they were going except me. I decided that Union Station was no big deal and I made my way back to Platform 9 3/4 and got back on the train. It really was the best decision for all involved. Leaving Los Angeles I figured it wouldn't be long now. It takes less than an hour by car from here. Wrong again. Next stop was Glendale, about 5 minutes away, then a hop, skip and crawl to Burbank, then Van Nuys, then Chatsworth, then Simi Valley, then Moorpark. These little towns were actually located in the hills that reminded me of Big Thunder Mountain Railroad. We even got to go through a tunnel or 2 or 3. I kind of felt like one of the settlers coming across country by train. Coming out of the mountains we stopped in Camarillo and then finally hit Oxnard which put us back on the coast. Did you know Oxnard was the strawberry capital of the world? Well, now you do! Any boy were they busy pickin' strawberries!! wondering just how many towns they could possibly cram in between Los Angeles and Santa Barbara, when finally...just a mere 4 hours and 45 minutes since we left Oceanside, we arrived in Santa Barbara. I have to say there was no stress from driving, no high gas prices, no getting lost, no parking to pay for and we could eat and drink to our heart's content. Those are some pretty good benefits as long as you have nothing else to do for that long. If you want to get there in a hurry, you better drive. I still haven't actually cruised on a ship...do they go faster than a train? And do they make as many stops? Tucked away in the mountains between Beaumont, CA. and Redlands, CA is a little tiny burb called Oak Glen. I think it is officially located in Yucaipa, CA., but it is not exactly on the beaten path. Years ago, while wining about missing the East Coast and my annual apple pickin' escapades, a friend mentioned to me that I could find some great apple orchards up in Oak Glen. So, while savvy auntie was still visiting we made this one of our day adventures. It really is like a different world when you get to a mile high in the mountains. The rolling hills and clear blue sky that we discovered up in Oak Glen, along with the apple orchards and working cider mills were enough to take me back in time. There is a scenic route through town that leads you to each and every orchard, farm, market, restaurant and even petting zoo. Beginning our self-tour was a stop at Riley's Farm where they feature "u-pick" apple orchards, hoedowns, tours and hayrides. They also do a schedule of civil war reenactments. If you are really adventurous they have Primitive Historical Farm Stays by reservation only. We did not have time to stop at every single establishment, which I am sure offers some sort of unique addition to the area. (I hear the spicy peanut butter is to die for!!) There is enough to keep you busy all day, especially if you are looking for something to do with your kids. Right in the middle of the scenic route sits Oak Glen Village where there is a Curio Shop, Art Gallery, Candy Kitchen, Bakery, Leather Shop, Country Store, and Animal Park. If you want to make a weekend of it, try The Sage Herb Farm where they offer Garden Getaway Weekends, along with herb classes and garden tours. There is also camping and RV accommodations in the area for you savvier tourists. So, young or old, there is something for everyone. Experience a heart-warming meal and a slice of apple pie, then stop by one of the shops so you can take home fresh apple butter, jams, jellies and candied apples. Don't forget to check back in the summer months when you can pick fresh raspberries! My originally planned trip to San Francisco got scrubbed due to an illness in the family...mine!!! The flu caught up with me and changed my plans drastically. So, no long distance travel for my savvy little family this time, but we did find a few day trips that were quite enjoyable and close by. Wine tasting is one of our main attractions here in the Temecula Valley, whether you are a local or a tourist, it never gets old. We are known as Southern California's Wine Country and we are quite proud of it. There are over 25 wineries tucked away in our beautiful little valley and they each have something special to offer. So, we took a day and checked out a few of them, actually just three of them to be exact. Our day started off with lunch at The Ponte Family Estate Winery in their very quaint all-outdoor dining restaurant, The Smokehouse. The warm Autumn day could not have been more perfect for outdoor dining, but then again, that's why we live in Southern California. The service was exemplary and generous. I say it like that because not only did our waiter take great care of us, he allowed my "Savvy Aunt" to leave with all of the wine glasses on the table...and the menu...and the dessert menu...and the napkins...only kidding, she didn't take the napkins. Lunch gave us the opportunity to do a little wine tasting with our food so we didn't do any official wine tasting in the Tasting Room as much as we just enjoyed the views of the vineyard and the mountains and the beautiful countryside. We also enjoyed the gift shop with all of it's specialty items including more incredible food and wine. The Ponte Winery is one that I highly recommend to anyone whether you are in the valley for a long visit or just passing through. I for one can't wait to try their Sunday Brunch Buffet one of these days soon. Our next stop was going to be what I thought was Van Roekel Vineyards. I have lived in the valley for over 12 years now and knew this winery existed. I saw their wine in the local grocery stores, but couldn't for the life of me find them on "winery row". I thought they had been affiliated with another winery once so we went there instead. Maurice Car'rie Vineyard and Winery was one of the first vineyards planted here in our region back in 1968. The actual winery was founded by Budd and Maurice C. Van Roekel in 1986. Hence the affiliation I had heard of! The Maurice Car'rie Winery is gorgeous as well as warm and inviting. Buddy and Cheri Linn are the current owners of this award winning winery known for it's sweet and fruity varieties of Chenin Blanc and Riesling, along with the traditional greats of Chardonnay and Merlot. While my savvy hubby and savvy auntie were partaking in the wine tasting passport offered at this establishment, I did a little asking around. I found out that I wasn't losing my mind after all and the so called Van Roekel Winery is now known as La Cereza Winery, the sister winery to Maurice Car'rie. Just so happens there is a combo wine tasting passport that can be purchased so that wine lovers can sample wines at both establishments for one low price. La Cereza Winery is also run by the Linn family and shares the talents of the same veteran winemaker, Gus Vizgirda. Both wineries have their own distinctive label, identity and wine list. La Cereza Winery has received a little bit of a face lift since being known only as Van Roekel. Although still very European, they have added some personal pizzaz with their new signature series "Girlfriends" wine and cigar products. Maurice Car'rie and La Cereza are both on my list of places to revisit, maybe for the upcoming holidays!! In a few weeks I will be traveling to the city of San Francisco for a short visit with my Aunt. She has never been to San Fran and I would really like to show her a wonderful time. The trick is...it is only for a few days so it has to be an abbreviated wonderful time. As a travel agent, I do realize the millions of things to do in San Fran. My question to my savvy readers is......what are the BEST things to do that you wouldn't want to miss no matter what? We aren't marathon runners so we can't exactly cram in 20 things a day (much to my Mom-In-Law's chagrin). I would like to actually enjoy this trip and leave her wanting more, maybe for next year's visit. So, bring on the suggestions folks.......I'm all ears! My Mom-In-Law sent me a book to carry along with me on my trip and I have to admit it is the coolest little travel tool ever. It is called The Little Black Book of San Francisco. I highly recommend that you check out Amazon for a Little Black Book of Anywhere you are thinking of traveling!!!!! Disney Cruise Line has announced that it will be repositioning the Disney Wonder to Los Angeles from it's home port in Port Canaveral, Florida. Disney Cruise Line did a "trial" run during the last two summer seasons operating cruise itineraries to the Mexican Riviera from the West Coast on the Disney Magic. The ship always sailed full. From a travel agent's point of view, I really understand the need for a Disney Cruise option that will include our Disneyland Parks out here in California. Paying airfare for a large family to travel to Florida before beginning their cruise can be the deal breaker for many savvy tourists here on the West Coast. Since Disneyland is not nearly as large as Walt Disney World in Florida, it will be nice to be able to add a cruise after 3 days of Disneyland Adventures. Disneyland is currently undergoing a major renovation in it's California Adventure Park and from what I understand, all will be revealed just about the same time as the Disney Wonder makes it's debut out here in sunny Southern California. We live so close to San Diego that many of our day trips are actually spent down in that area. We have a whole repertoire of activities that we like to do depending upon the weather or perhaps the visiting relative at the time. It just so happens that every time we start to head south we drive right by Mt. Palomar and my mother says "I would really like to see the Mt. Palomar Observatory sometime." Of course, we are already on our way to somewhere else so her wish always goes unfulfilled. Just recently while trying to think of something special for her birthday, we remembered her desire to drive up Mt. Palomar and see the Observatory. Our day started off unusually warm even for SoCal. It was in the mid 80s with those warm Santa Ana winds blowing. We knew better than to be fooled though. We were planning to trek up over 5000 feet so we knew it would be a little cooler and we remembered to take a few jackets, just in case. We pile in the truck and decided (as we usually do) that we were all hungry. What is it about a road trip that makes people so hungry? There just so happens to be a very small burger stand right off the exit we take to start up the mountain so we thought we would try it. I had heard great things about it, but it always looked abandoned whenever I drove by. This little stand I refer to is called Nessy Burger. If you follow that link, you will enter a food blog that did a detailed report on the Nessy Burger. I can update a few things like...they are now open on Sundays and the burger is a little more expensive, but other than that, this guy really hits the nail on the head. I thoroughly enjoyed my Nessy Burger, although I could feel my arteries clogging while I ate it. The burger had an awesome flavor and was very juicy and fresh. The dining ambience...well there really isn't one unless you call sitting next to a busy freeway exit on a picnic bench with migrant workers ambience. Then again, that's pretty much authentic SoCal and I like it! After we finished stuffing ourselves, we headed on up the mountain for our adventure. It turned into quite a pleasant day. The skies were clear which made the views breathtaking. The traffic was minimal and we had several chances to stop and take some pictures. We were able to see the charred reminders from the fires in the last few years. That part was kind of sad, but there were many signs of new life sprouting up around the dead trees. Of course as we made our trek higher and higher, it started to get considerably colder. When we rounded the corner at the top of the mountain and headed toward the Observatory on the north side, there was snow and lots of it. The roads had been cleared but there was snow piled up on either side with people who had stopped just to get out and build snowmen and slide down the hills. I took in the beauty of the meadows that were covered by a blanket of undisturbed snow. I did see one guy who was making a snowman in the back of his pick up truck to take home with him. I'm not sure if he thought this all the way through or was perhaps just trying to make his kids happy. We finally arrived at the Observatory and it was a blustery 41 degrees. It was quite refreshing for a few minutes, then it was just plain cold. The few extra jackets we brought did not begin to keep us warm enough for this weather. I am not complaining though, I really enjoyed seeing the snow and feeling the cold. I surely did not feel as though I was in sunny SoCal and that was okay for a little while. I can actually see the Observatory from my house on a clear day, but I had no idea of it's actual size being as it is so far away. This structure is magnificent, and the size of the telescope inside is unbelievable. It is an awesome site for both young and old. The history behind the Observatory is very interesting in that it took over 40 years to actually be realized, including taking a break for WWII. One of the most interesting parts to me is the transportation of the 200-inch mirror up the mountain. The trip that took us only 1 hour including "Kodak Moment" stops, took 3 trucks 32 hours to arrive safely with this precious 40 ton cargo. When most people think of Southern California, they think beaches and sunshine and probably movie stars. Well, we do have all that, but we have much more. Since I was raised on the Eastern Shore of Maryland, I am more used to seasonal changes and some occasional weather issues like cold temperatures and snow. That is something I kind of miss...maybe just a little. The rest of my family, except for maybe my son, thinks I am a bit mental. The other day we took a day trip to Julian, CA. to share with my Aunt who was visiting from West Virginia. I like to visit Julian occasionally because there I can experience all four seasons. At just over 4,000 feet elevation, Julian provides a mild Summer for hiking, camping, and fishing, and a colorful backdrop for fun Fall activities. The Winter brings the perfect wonderland for the holiday season and then Spring produces all the flowers and new nature that warms our hearts after a cold Winter. Julian, CA. is an historic gold mining town that was founded after the Civil War. Although it is quite popular with tourists, it has remained small in general population and retains it's old world charm. The tiny town has since taken on new found fame as "Pie Town" because of The Julian Pie Company, who ships pies out by the hundreds to all over the country. There is plenty to do in Julian for the whole family. They have shopping (my favorite), Art Galleries, historic sites, dining, wine tasting, and of course, many types of lodging. A trip to Julian makes a great day trip if you live in the area, but I think I will stay for the weekend next time I go so that I can experience all the dining options. That is very hard to do in just one day, especially when there is pie involved!! Next time we venture to the Gualala and Sea Ranch area up in Northern California, we will absolutely be staying at Breakers Inn. I took a chance on it from reviews that I had read and pictures on the Internet. It turned out to be just what I was looking for. Our time in Gualala was very relaxed and we didn't have much on our schedule. 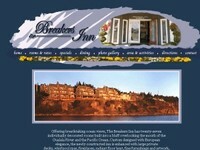 That left us all the more time to thoroughly enjoy the accommodations provided by the Breakers Inn. Breakers Inn is a sprawling beachfront hotel that looks as though it ties the entire town together with it's quaint and welcoming atmosphere. It has a weathered exterior and a warm, inviting inside. It really is the perfect place to be while watching the sun set over the Gualala River as it flows out into the ocean. Each room has it's own individual theme and is decorated with the feel of a different region. We stayed in "Denmark". We had a beautiful four poster bed with soft comfy bed linens. Our bathroom had a separate steam sauna and huge shower. The best part was the whirlpool spa tub situated perfectly in the room with a private ocean view. We also had a fireplace, but since it was July we really didn't have an occasion to use it. I think I will return in the winter just so I can have a fire burning while in the tub watching the sun set over the ocean (maybe a glass of wine would be in order too). To make things even better, the room was also equipped with a wet bar that included refrigerator and microwave and coffee pot. You really don't have to leave your room if you don't want to. Of course you will probably want to venture over to the free continental breakfast provided each morning. I ate my breakfast in my room, sitting on my own private deck, drinking my morning coffee and watching the sea gulls play on the beach. How great is that? If I had more time on this trip I think I would've curled up and read a good book out on that deck. Could be a plan for my winter trip!! If I am only staying somewhere for a few days, I usually prefer to forego the maid service. Breakers Inn offered a service where the housekeeping staff will leave a basket by your door filled with everything you need including fresh towels, toiletries and coffee supplies. This is absolutely where we will be staying for all of our Gualala area visits. I recommend this place whole heartedly. After one final stroll through the Town of Tiburon, we headed out north on 101 toward Petaluma. The first Petaluma exit is Petaluma Blvd. We turned off the highway there and headed west towards the coast, connecting with Bodega Ave. in the center of town. Bodega Ave. takes you on a beautiful and relaxing journey through the country all the while smelling the ocean getting closer and closer. As we drove for about 40 minutes, enjoying the scenery and peacefulness of the countryside, I started to realize I felt as though I had traveled back in time. The closer to Bodega Bay I got, the stranger things felt. That must be what Alfred Hitchcock felt like when he decided to film The Birds. A lot of this famous thriller was actually filmed in Bodega Bay and the small town of Bodega back in 1963. Believe me when I say nothing has changed since then. While waiting for family to arrive to meet us for lunch, we had some time on our hands and decided to check out the area and walk along the harbor's edge. I expected a lot of activity considering this is July. Don't all people flock to the coastal towns for vacation in July? Well, not here. Again, I felt as if time was standing still here in Bodega Bay. There were hundreds of beautiful boats in the harbor, but no one there to use them. It was low tide and there was a beautiful expanse of beach to enjoy, but only one lone person digging for clams. There was an abandoned boat in the middle of the harbor that just gave you the feeling that everyone had disappeared and didn't care what they left behind. It was actually starting to make my skin crawl, and I knew exactly why Alfred Hitchcock picked here to film his horror movie. I am thinking that a remake is in order because nothing has changed, if anything it is creepier now! We had lunch at a small diner located on the opposite side of the harbor. It was pretty busy, but I think it was only because there are not that many choices in town. I got the distinct feeling that they do not cater to tourists. The service wasn't that great, the flatware wasn't that clean, and the food wasn't that fresh. The clam chowder was incredible, but that is where it ended. The bill wasn't very reasonable compared to the quality of the whole experience. I felt as if they were serving food as a means of survival. Almost like everyone in this town is trapped here and has to make do with what they have available to them. I would not have been surprised had I received a "Help us" scribbled at the bottom of our receipt. We took a few moments to drive through the actual town of Bodega as that is where the house that was used in "The Birds" is being kept as a landmark. It is only open to the public during the weekends on certain hours, so we didn't get to see inside. From what I understand this is the main attraction in town, but again, I feel like it has been forgotten and neglected like everything else in this town. Back in the day, I think the hustle and bustle of Tiburon, CA. was more than it is today. The tiny peninsula that plays host to three different communities was a very busy industrial center. The Town of Tiburon (as it became known in 1979) was the center of activity with fish packing plants, dairies, military installations, cattle ranching and the railroad. Railroad cars, locomotives and also ferry boats were built there to serve the San Francisco Bay area and beyond. Tiburon even survived Prohibition being that it's location made it very easy to sneak in alcohol from ships anchored in the bay. The Town of Tiburon is the largest of the three communities. There is also Belvedere, which was known as a subdivision for the wealthy San Franciscans who built weekend homes there, and Strawberry, which remained a dairy ranch until after World War II. Today, Tiburon is a nice quiet place to relax and "get away from it all". There are still many buildings and establishments that have been there for many years and keep the charm of the town intact. The railroad is long gone, except for a few casual reminders like the passenger depot and the Depot Palm that had been used to mark every passenger station in the Northwestern Pacific system. Even with tourists, the town is peaceful and the people are friendly. Many of the residents are commuters to the San Francisco area and use the ferry system to get to work. The tourists (like myself) use the ferry to spend the day in San Fran while being able to get back to peace and quiet for the night. That was a perfect day! We grabbed a bite to eat at the coffee shop on the corner of Main Street, then waited for the ferry to arrive while exploring the downtown wharf area with camera in hand. The cost of the ferry was a little high at $9.50 per person each way, but considering you are not fighting traffic,or paying for gas, toll, and parking,I would say it was worth it. The schedule is very convenient for both commuters and tourists and the trip itself was very pleasant and relaxing. They do not waste any time either. You board the ferry and buy your ticket onboard after leaving the dock. Very simple. We walked around Fisherman's Wharf, taking in all the sights, mostly just around the Pier 39 area. We shopped (my favorite thing to do) and ate (my other favorite thing to do if I'm not shopping) and took pictures of everything and anything as usual. We ate a fantastic lunch at Pier Market Seafood Restaurant which had the best clam chowder ever and some luscious libations to go along with it. It is very difficult to decide where to eat while at Fisherman's Wharf. Everything sounds and smells so good and many menus are similar in that their specialty is seafood. Price can be a deciding factor and also ambiance (if you can call it that on a wharf). All the restaurants have their menus posted outside so you know what they offer before making a commitment. So, with tired feet and full stomach we headed back to Tiburon at the end of the day via ferry with the sun in our faces and the cold breeze at our backs. This is July and yes, you need a jacket to be able to enjoy the ride from the outside deck. You can also take shelter inside where there is a little beverage bar for anyone needing a coffee, beer, or snack. Again, very convenient. There are actually many different ferry services to choose from whether you are departing from Tiburon or from San Francisco. You can visit Sausalito, Angel Island, or even take a tour of Alcatraz Island. Of course, you cannot do all that in one day. It was back to Tiburon for us, and the ferry trip gave us the opportunity for even more picture taking that we could later bore our family to tears with. There are most certainly things to do without leaving Tiburon. There are many adorable little shops and eateries all along Main St. to explore, although a tad pricey. Everything is very unique and a little "artsy", mostly gallery and boutique type establishments. There is a strip of shops known as Ark Row, where all the shops used to be houseboats on the lagoon. They are now anchored permanently by land and a parking lot and almost resemble a movie set because of their small size. Many people rent bikes from San Fran and ride the ferry over to Tiburon and spend a leisurely day riding along the coast of the bay and through the town. For us, it was a perfect place to relax and do whatever we wanted without the pressure of a schedule or activities list. We even took an evening stroll through town admiring the architecture, beauty and peacefulness that is the Town of Tiburon. As if to mark this lovely spot on the map, there is a beautiful sculpture in the center of town that moves likes sails in the wind. There has been more than one list compiled to represent the Seven Wonders of the World. I did not realize this, I thought there was only one. I guess what that really means is that no one could actually agree on just seven. That brings me to my post. On our way to Tiburon we drove across the Golden Gate Bridge which connects the city of San Francisco to Marin County. As we were crossing the bridge I was in complete awe of it's structure and beauty and the statement that it makes just by being there. You see the Golden Gate Bridge all the time on TV, in movies, in books, magazines and in travel brochures. It is one of the first things that come to mind when someone mentions San Francisco. It is a landmark like no other. Until now, I have to admit I took this bridge for granted, since it has always had so much recognition. I was not anticipating the emotion that I felt as we crossed under the huge support towers of this renowned suspension bridge. I immediately thought of it as a wonder of the world. After returning home, I did a little research and found that The American Society of Civil Engineers must have had the same feelings I did because this particular bridge is on their list of the Seven Wonders of the World. Here are a few photos I tried to take, but believe me when I say you must see it in person. San Fran has some funky weather that makes photography either a thrill or nightmare, depending on the moment. I began my trip by flying First Class from San Diego to San Francisco via United Air Lines. There may be a better way to go, but I can't think of one. The service was great, the flight was uneventful (which is how I like my flights), and everything was on time. Of course I was not offered a meal, only a small bag of pretzels and a soda, but for an hour long flight, that seemed appropriate. I always enjoy flying into San Francisco. People watching is a funny little habit of mine and San Fran certainly has an interesting mix of folks to watch. I had already made arrangements for a rental car online with Budget so all I had to do was go pick it up and be on my way to my savvy little getaway in Tiburon, CA. I had done quite a bit of research on the available rental cars for type and price and other miscellaneous issues involved in renting cars, and decided upon Budget. Well, I think that most of the people arriving in San Fran that day had done the same research and come to the same conclusion and were standing in the same line waiting to pick up their rental car. Just my luck! What I did learn, while patiently awaiting my turn is that Budget offers a new system called FastBreak where you can reserve your car and drive away without any hassles. No paperwork, no waiting, no added expenses. Just fill out the enrollment form online and the next car you rent will be the easiest thing you've ever done while traveling. We asked the rental agent the best way out of the airport to 101 North towards Tiburon. (The last time we tried to drive directly through downtown San Fran while following a map which didn't bother to tell us which roads were one way). We apparently like to learn things the hard way. The agent muttered something about a convertible only being an extra $15, would I like to upgrade? No, I would not like to upgrade, what is the best way to 101 North? His answer was some sort of jibberish that sounded like 380 - 280 - 19th street. So that is exactly what we did, and amazingly enough, it worked. Golden Gate Bridge here we come. BTW- the extra $15 is per day not total, so don't think they are offering you any kind of deal at the last minute. As I mentioned in an earlier post, I will be headed to Northern California next month for a little business and pleasure mixed together. My intended destination is the area known as Sea Ranch located about 100 miles north of San Francisco along the coast. Sea Ranch is a quiet little unincorporated area that has become a popular vacation spot. Not widely known, Sea Ranch is actually filled with repeat customers every season as people are always coming back for more peace and quiet and getting back to nature once they discover this beautiful little part of the country. There are many ways to experience Sea Ranch. You can stay in an upscale hotel, a Country Inn, an historic hotel, or perhaps a small cottage in the tree covered cliffs. There are also many homes for rent, whether for a week or a season. There is also camping for anyone interested in sleeping with the bears. Just about 10 to 12 miles north of Sea Ranch is a quaint little town known as Gualala. Gualala (pronounced locally as wa-la-la) used to be a very profitable logging town, providing much needed lumber to the San Francisco area after the earthquake in 1906. Tourism is now their main source of economic resource. Gualala is named after it's perfect location where the "river meets the sea". Being in Gualala is like being in a novel and turning back time. You can sit for hours on the beach and never get enough of the view or the undisturbed wildlife that surrounds you. I plan to take a "moonlight float' down the Gualala River while I am there, and of course I will also be using this wonderful place to refine my amateur photographic skills (or lack thereof). Speaking of photography, that leads me to the reason for my trip. I will be attending a photographic arts showing in the Burnett Gallery of the local Gualala Arts Center. I have made my reservations for lodging at The Breakers Inn and I look forward to writing about it upon my return. I have made arrangements to take a tour of the property and their facilities so I will have more to share with all of you. If you have been a savvy tourist for awhile now, you will know that I am humorously known as "Annie Ego", the much-feared travel critic. This is derived from the movie Ratatouille by Disney, whereas "Anton Ego" is the very much-feared food critic. For me, it is all in good fun. The name that is, not the critic part. I take my reviews very seriously and I am a stickler for Customer Service. That is something else that all you savvy tourists already know about me! The reason I even bring this up is because it is time once again to travel and I am trying to decide which establishments I will be evaluating on this trip. I am scheduled to attend an exhibit and reception at the Gualala Arts Center on July 12th. There will be a photographic exhibit inspired by one family's travels to Switzerland over many years. I am very much looking forward to this trip and I plan to make a stop or two along the way. After all, that is what a good travel critic does, right? I am hoping to spend a little time in Tiburon, CA., just across the Bay from San Francisco. I drove through there about seven years ago and made a mental note to myself to go back if ever I got the chance. They have ferry service across the Bay to San Fran's Fisherman's Wharf and other area attractions, so I thought it would be nice to stay in a quiet little romantic town and take the ferry over to the hustle and bustle of the big city. I have had my eye on The Lodge at Tiburon ever since I heard about their $6 million renovation. It has the perfect location at the tip of the peninsula and is surrounded by quaint little shops and cozy restaurants. This should be a great place to add to my "review repertoire" and share with my devoted savvy tourists. Guess what? The Lodge also has complimentary wireless Internet access which we all know ranks very high on my list of criteria. This last Thursday evening we had the distinct pleasure of hearing a group of extremely talented musicians perform at The University Of Redlands. U of R's Jazz Band is made up of some of the finest young musicians I have ever had the privilege to hear play. The amount of talent and character that each musician brings to the table is just amazing. If you ever have the opportunity to visit the University and hear any of the musical ensembles perform, I strongly recommend that you do so. In the meantime, check out the photo album I posted of The University of Redlands Jazz Band. The Carrier Pigeon, a 175-foot long clipper ship with a gilded pigeon as her figurehead, was launched from the shipyards at Bath, Maine in the fall of 1852 and left Boston on January 28, 1853 for her maiden voyage around Cape Horn to San Francisco. On the morning of June 6, the vessel was spotted off Santa Cruz, but visibility worsened and shrouded the ship in a thick blanket of fog as the day progressed. That evening, the captain, believing he was a good distance from land, steered his vessel shoreward. Before land was sighted, the Carrier Pigeon struck rocks and quickly began taking on water. The captain and crew made it safely to shore, but the ship was a loss. After offloading a good portion of the supplies, the vessel, valued at $54,000 and still stranded on the rocks, was sold for $1,500. Since the time of the wreck, the point of land closest to the rocks that claimed the Carrier Pigeon has been called Pigeon Point. Previously, the point had been known as Punta de las Ballenas (Point of the Whales) as a whaling station was located nearby. At least three more ships were lost near the point in the 1860s, prompting the editor of the San Mateo County Gazette to write the following in 1868. "Pigeon Point is the most extensive promontory on the coast south of the Golden Gate, and which point seems especially adapted for a light-house. No other one place on the Pacific Coast has proved so fatal to navigators as this locality, and it behooves those most interested in maritime affairs on the coast as well as in the East to bring their influence to bear immediately upon the government officials, and never relax their efforts until a light-house is erected at Pigeon Point." 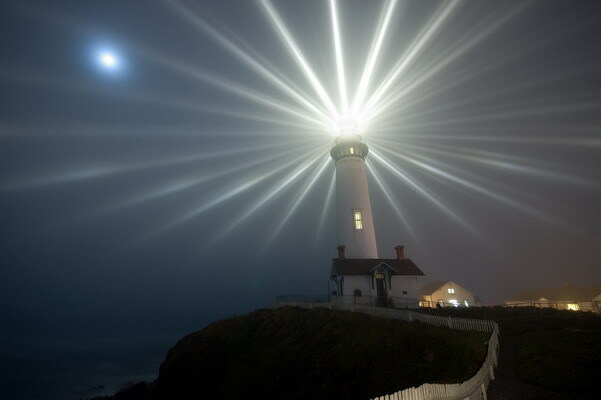 Once per year at the Pigeon Point Lighthouse they shut down the modern light and switch over to the 5 kerosene lamps and fresnel lens of the original, as it was 135 years ago. For the first 5 minutes they leave it static to indulge all of the photographers who turn out and want to capture this once in a lifetime shot. Below is one such photographer's embrace of the moment.